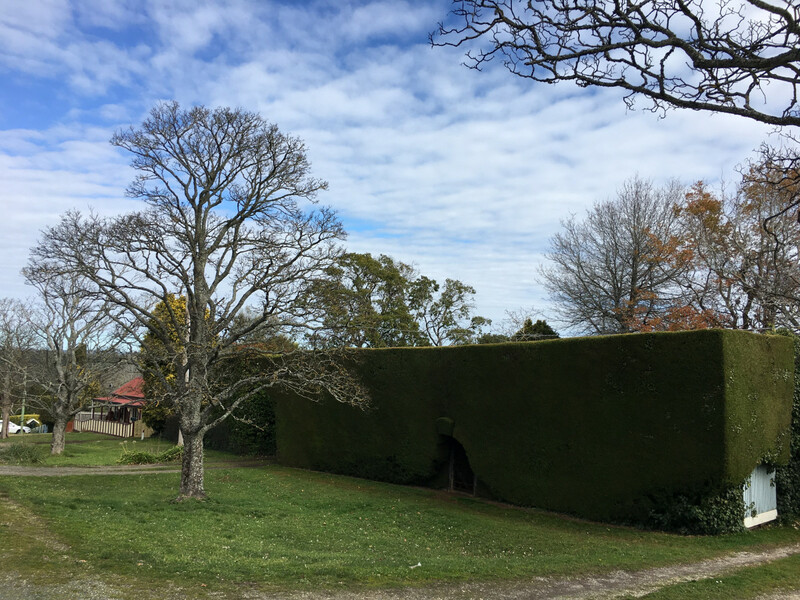 Daylesford, Victoria – given its proximity to various luxury resorts and home-stays – is a popular and trendy destination. It’s an old town with a lot of heritage and there are still plenty of vintage residents around – both human and mechanical. 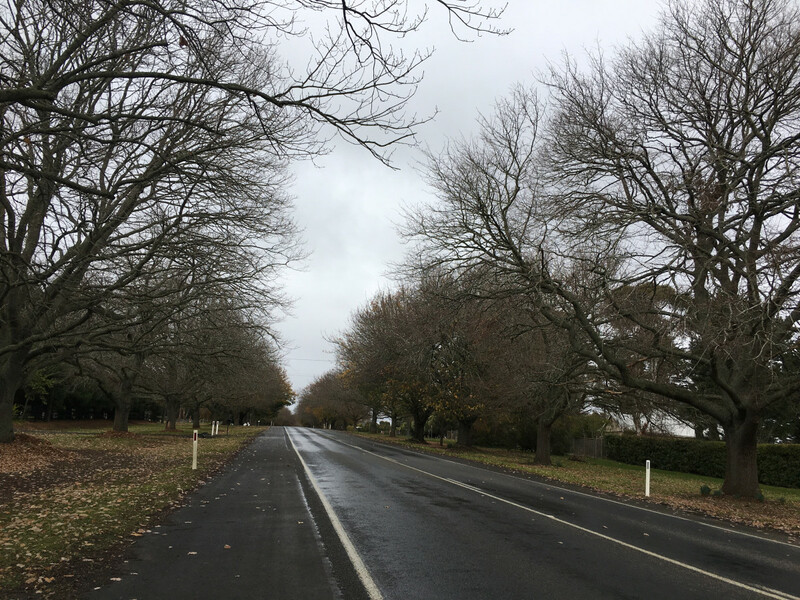 To a Queensland boy, the drive out to Daylesford was like no drive I’d ever taken in my own state. The presence of moss everywhere, for example, was in stark contrast to the drier scenery in Queensland. The buildings are also different in this colder part of the country. Historically, this area was home to many Swiss and Italian immigrants and some of the architecture shows a continental influence. In particular, I noticed many buildings that were rendered but with exposed stonework as accenting, something which brought to mind French provincial architecture. 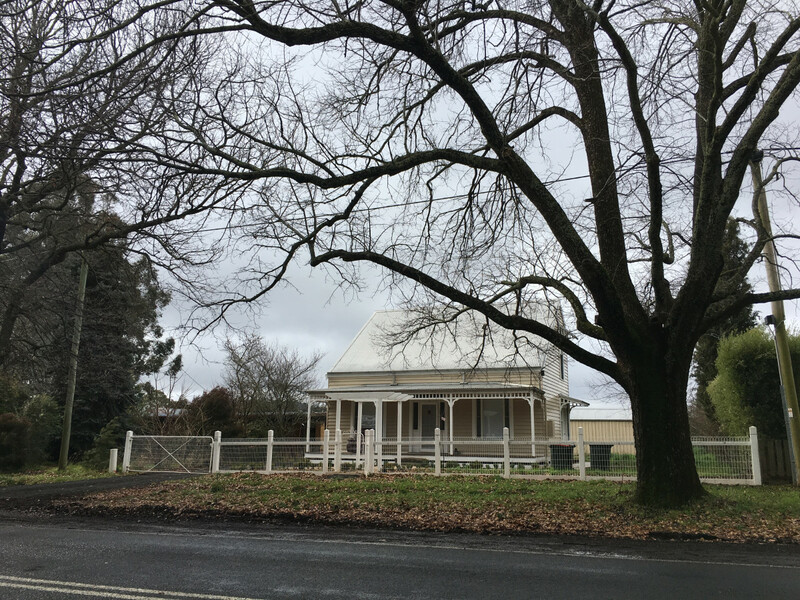 I didn’t get a photo of any of said buildings, unfortunately, but here’s an adorable, arguably less European-influenced house in nearby Glenlyon. 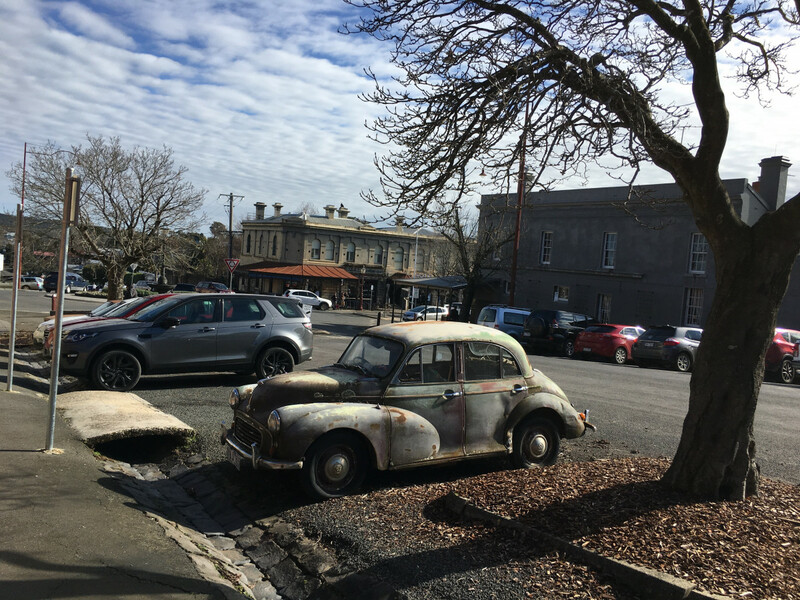 Daylesford has a population of 2,548 people but a healthy tourist economy. 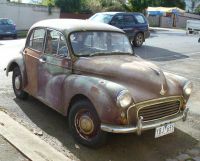 I doubt very much that this Morris Minor belongs to an out-of-towner, however. 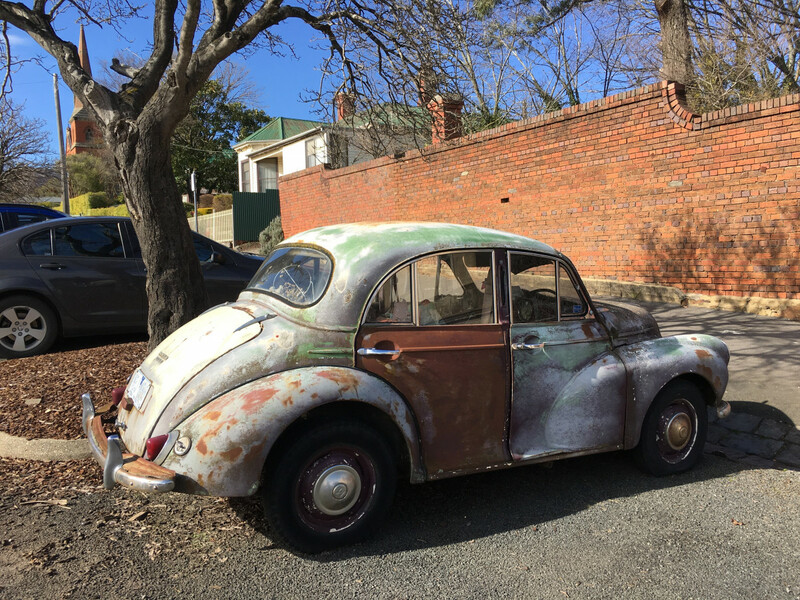 Everyone’s grandparents in Australia seemed to have a Minor at one point and this car comes from a period where Australians still bought British cars in significant numbers. Although we are still part of the Commonwealth and Queen Elizabeth II is still on our currency, our interest in mainstream British cars waned long ago – enthusiasm in British cars had atrophied by the late 1970s. It probably wasn’t cars like the Minor that turned us off as these were pretty bulletproof. They were also surprisingly innovative, at least when they first launched in 1948 – independent front suspension when most rivals had a live axle, unibody construction, and rack-and-pinion steering years before that set-up was commonplace. The Minor was designed by Sir Alec Issignois, after all. The Minor saw various revisions over the years. It was a lot of years, too: the last Minor was produced in 1971. There’s still a decent number of these in Australia but they’re usually in better shape than this one. 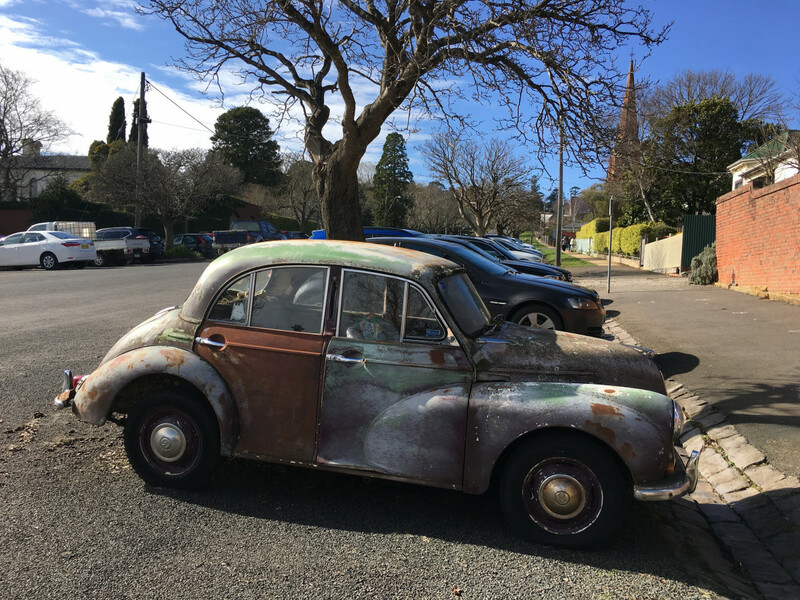 This vintage Daylesford resident is endearingly rough and stands out among the hordes of late-model vehicles in this small Victorian town. Curbside Classic: 1955 Morris Minor Series II – Britain’s Favourite Car, Bar None, And Rightly So. 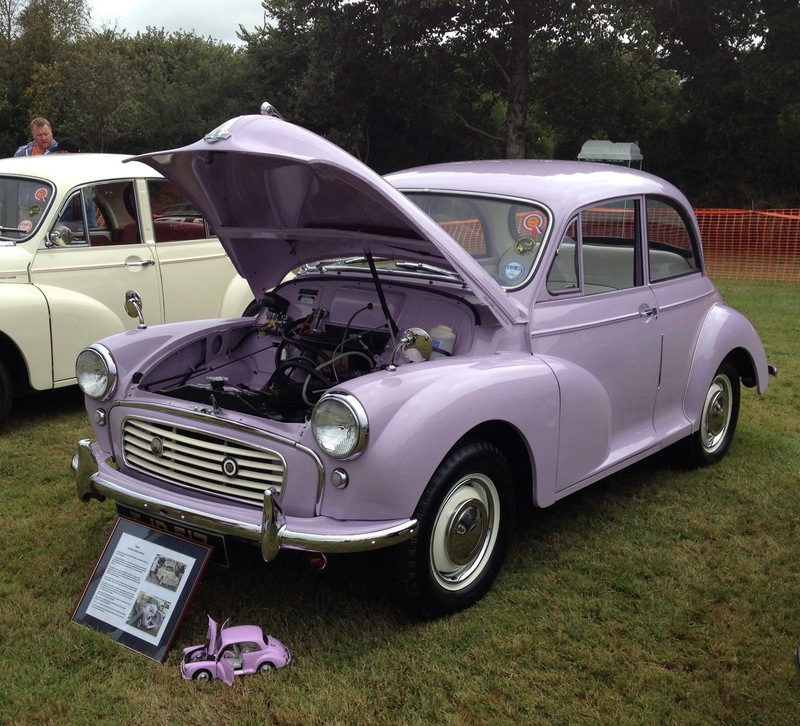 Who doesn’t love a Morris Minor? I have seen one or two here in the States over the decades. I think they had some popularity here in their day, but not a lot. They peaked in the 1958-9 recession/small-car boom but were offered from 1949 (model year, essentially simultaneous with the October ’48 UK launch) into the early ’60s with some sources claiming none were imported after 1961 or so with as many of two model years’ worth of relabeling to clear unsold stocks. Some (other) sources speak of another batch of 1967 models. MY grandparents, when they lived in Clayton, Mo Had a neighbor who owned a fastidiously kept Morris Saloon. This was quite long ago When such was still purchased new. Where in The St. Louis area. I have no idea. It was a wine color with a black and tan interior. Or so I remember. It disappeared in the later 60s and a Volvo took it’s place… The neighbor was a Professor at a local Prep school, if that explains it. And No, I did not attend… Public schools all the way, baby. Until University, anyway. I have no idea why, but back when I was a kid in my small, rural, Pennsylvania hometown a few women owned “unusual” cars. My aunt, for instance, owned a Volvo PV 544, probably the only Volvo for 50-60 miles in any direction. Another woman, a former neighbor, owned both generations of Corvair convertible: a Monza and a Corsa. But the puzzler of the bunch was the wife of the local Chrysler-Plymouth dealer, she had a Morris Minor convertible….and not, say, a Hillman or other Rootes product. The Morris was my least favorite of those three because with it’s balloon fenders it looked old, an impression not helped by the car’s turquoise color. 74 was when they finally ended Minor production, quite likely a mistake as there was nothing in the BL lineup anywhere near as good, I dont know if Australia got any but there was an Austin Minor with crinkle grille bars and an Austin logo on the horn press I drove a near new 73 Austin Minor van for a couple of weeks, it was a fun little car. Plenty of Minors still on the road in NZ some still in daily use. There was a ’60s Minor in my neighborhood for several years. Clean and solid. I had seen it running before it was parked. I walked past it every day, always watching for the For Sale sign, ready to LEAP at any price… but it never showed a sign, just disappeared a few months ago. Damn. Sorry William, I didn’t mean to steal your thunder yesterday. I just couldn’t bear the thought that the Minor was gone. Good to know it’s still there. Here’s another 2013 shot. Shame it’s looking as ratty as ever, it really needs some love. Not a problem! Sounds like it’s a town fixture. Winter in spa country, brrrr…. I went there several years ago, a very nice collection. The car here is a 1958 according to registration records. The tree-lined road in the 2nd & 3rd pictures is part of the Avenue of Honour, to commemorate the local soldiers who served in World War 1. 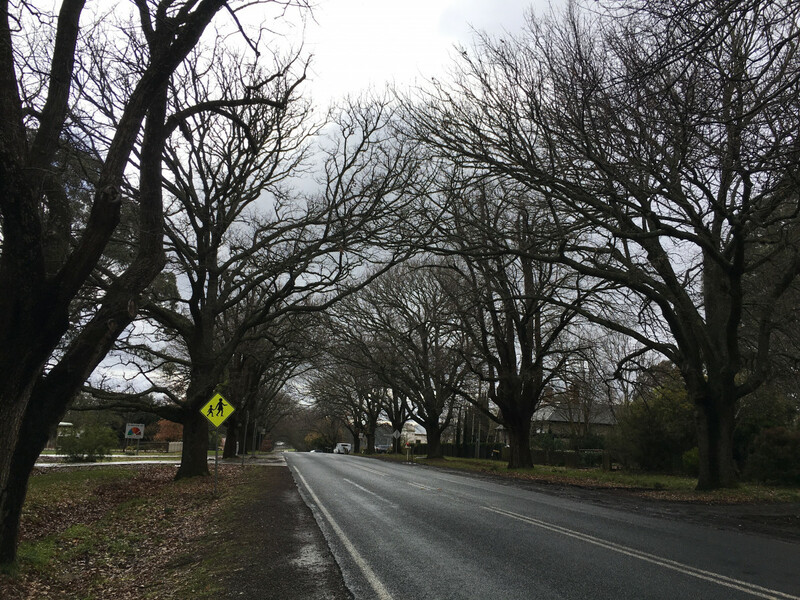 Google tells me the Daylesford one featured 80 sycamore trees planted in 1918. There are hundreds of them like this in towns around the state. You’re an excellent writer and photographer William. Having the luxury of more room to work with in taking country and suburban pics, as opposed to confined city street images, allows you to create better composition and mood in your photos. These are very nice photos! Thank you Daniel, that’s just the pick-me-up I needed today! These photos turned out very well but I credit the beautiful scenery and the lovely day. But yes, it is refreshing to get out of the same old “loops” I travel in every week. Not just for the new scenery but also to be able to photograph cars somewhere else. I love having shots where there’s distinctive scenery in the background. I’m sick of the same brick walls and parking lots. My favourite place where I’ve photographed cars was San Miguel de Allende in Mexico. I think I still have some photos I’ve yet to share. You’ve been a tremendous addition to Paul’s site, William. You and Don have submitted so much outstanding work. As I mentioned in a comment to Don once, I believe that limited exposure and experience with some car models might limit comments from North American readers. But it is no reflection of the quality of work, attention to detail, and enthusiasm you deliver. And you are always partial, and super professional. The quality of your images go beyond this set, the composition and lighting is consistently excellent. You have many excellent earlier sets. The New York shots are great too. Like Joe Dennis, you bring in the background to compliment the cars. I really like the Spring lighting in these, with the lower sun creating stronger shadows, and richer colours. I’m utterly humbled. Those are some of the nicest things I’ve ever had said about me. I can’t hold a candle to Joe, though… He’s a legit photographer, I’m just a dude with a phone (and, once in a while, a hybrid DSLR). But that you can find my photographs so enjoyable speaks a lot to the quality of phone cameras nowadays. I was looking at some old photos from my first iPhone – I think it was a 3 or a 4 – and wow, they’re garbage, relatively speaking. I just bought a Google Pixel 2 XL and I’m about to head overseas tomorrow so I’m hoping to bring y’all some new scenery and some good photos! As for Australian stuff, I always try to frame things in a way that outsiders can relate to. But I can understand why a Holden piece mightn’t generate as many hits or comments – our readership base is predominantly if not entirely North American after all and my country is a small one. Well, population-wise, certainly not geographically – my state is bigger than Texas! I work in communications, so I know great work when I see it, and that hard working people are often not credited in general! I know Paul, and his readers, greatly appreciate all that you bring to CC. To be honest with you, I used to think you were sometimes too forgiving with cars that didn’t deserve the credit you were giving them, but it was very reflective of your natural enthusiasm all along. Minors were not uncommon in my part of California through the early ‘70’s. The wife of a colleague of my dad drove a convertible Minor. This, supposedly the 1,000,000 Morris Minor off the factory floor. Photographed at a tiny, local village show in Cornwall, UK, earlier this month. I believe it’s the genuine article. Who else would paint a car in such a ghastly colour. I’ve no idea if that’s the actual millionth, but I do seem to recall that they made about 350 “Minor Millions” – all in that startlingly awful colour! William, a delightful series of posts. Ah, Daylesford, one of my wife’s favorites in Vic., a magnet when we return to visit relations in Aus. 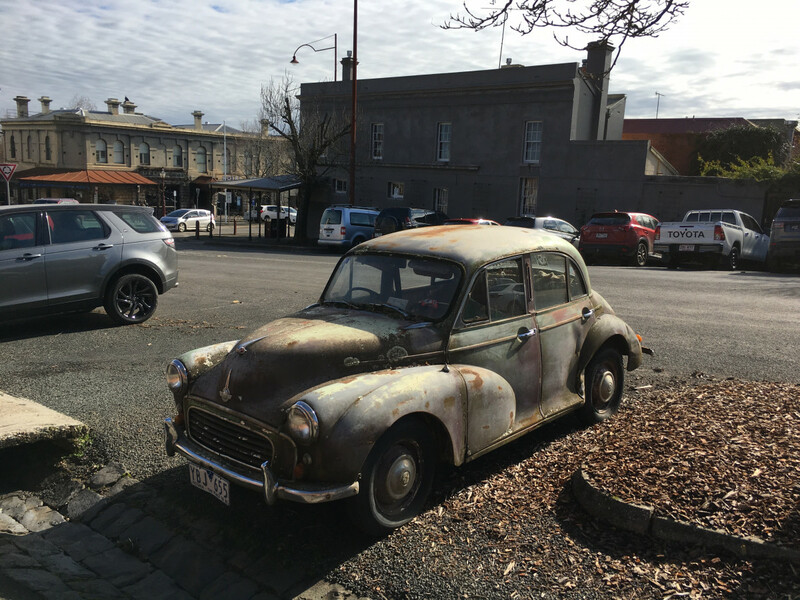 Daylesford, a short drive from Ballarat, Sunbury, and Geelong, and a town which always gives us a smile. Thank you for the sights evoking agreeable thoughts and memories for both of us. Hopefully you tried the superb wood-fired pizza in Daylesford. Cheers. Bare trees; oh right, it’s winter down there!We could sure use a spot of rain here right about now. Thanks for the tour; lovely place. It reminds me of some little rural towns in Northern California.